Hunting is an ancient and noble activity, and bow and arrow are one of the primary tools humans used for hunting. Though the origin of bow and arrow stretches back thousands of years, we still use them today. In this article, we will discuss the best hunting arrows your money can buy. 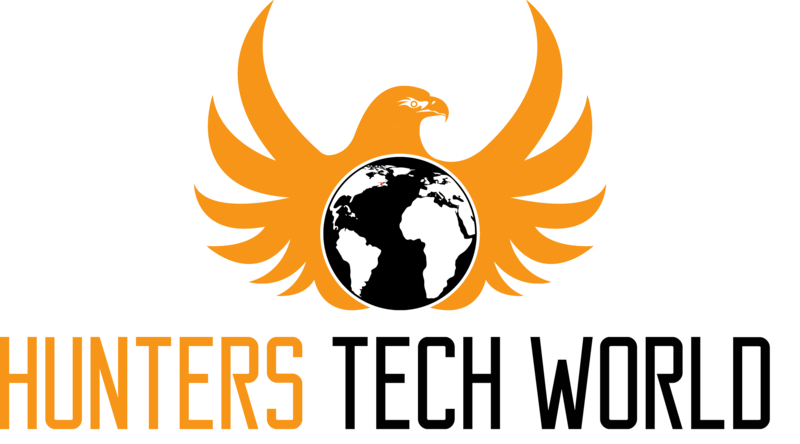 We will go through several products, describe product's strengths and weaknesses. The emphasis will be put on product's material, weight, velocity, and precision. After that, we will provide a guide on how to select the best hunting arrows according to your needs and preferences, having in mind that our best choice isn't necessarily your best choice. Alas, we will wrap things up with a couple of critical information you should pay attention to when buying the best hunting arrows. We hope this article will help you decided whether or not the products on this list are for you. 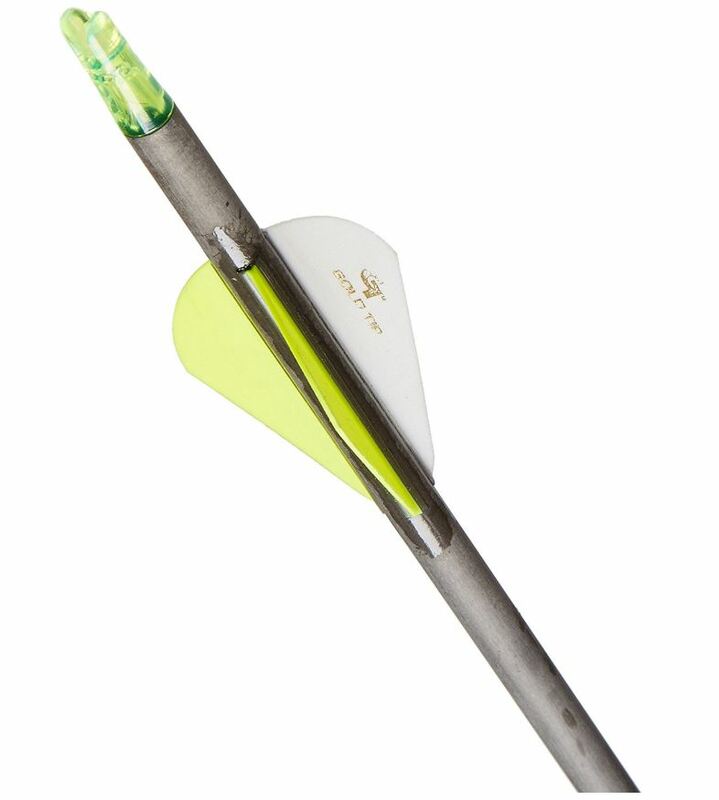 We are starting our list with the Gold Tip Arrows, the XT version that put the Gold Tip in the spotlight. Two things you should have in mind when observing these arrows: speed and durability. Due to golden tips, the Hunter XT arrows are excellent at penetration. Moreover, the golden tip also enhances the velocity of the arrow. The Hunter XT arrows are made with Gold Tip's Smart Carbon Technology (more info on this subject here), making them highly durable, and will last a lifetime. Due to the Smart Carbon Technology, these arrows are robust and consistent, each made with care and passion, resulting in unmatched performance when it comes to hunting. The product comes with Golden Tip Nock and Accu Lite spine, 300-400 hundred in regular size, and 500 small ones. Most importantly, you will receive six arrows included in the package. The outer diameter of these arrows ranges from 0.291 to 0.302, inner dimensions being 0.246. When it comes to straightness, the Hunter XT +- a 0.003-inch tolerance, which is excellent, but not the best of the best. However, virtually anything below 0.006 inches tolerance will do the job. When selecting spine, make sure the arrows are compatible with your bow, and that you are comfortable using it. Calculate the IBO/ATA specs (you can use this free calculator), and see if the FPS range suits you better. It is all about speed and speeds consistency, so do the calculations and then select preferable spine. I do love these bows, for they are very cost-effective and precise. Due to the 0.003 inch straightness, these arrows will have no trouble hitting the target, assuming you do your part. They are also highly durable, made of quality material and with Smart Carbon Technology. Due to the arrow's velocity and precision, they are excellent for hunting. Vines are also robust and highly durable, making them suitable for hunting in unexplored areas. And we are coming back to those two terms, speed and durability. You can add precision to the list too, for these arrows won't disappoint you and will hit the target. The downside is the arrow shafts you have to clean and don't get your hands dirty. You should also be careful with these arrows; though durable, inserts are fragile, so beware of that, especially when you are installing the inserts. The Easton stepped up their game, introducing Full Metal Jacket arrows that bring more penetration with their spine 340 (you can also opt for the 400, but we will not cover it in this article). The Easton emphasize precision and penetration, more focus being put on penetration. The reason why many hunters opt for these arrows is their penetration potential and knockdown power. Furthermore, the N-Fused carbon made core is protected and covered with the FMJ technology, assuring the bow will not only hit the target but also go through it. It will go through bones, which is great if you hunt large animals. Knockback shouldn't be neglected too, for it can stun and know the target even if it doesn't kill it. Easton FMJ N-Fused Arrows feature better straightness than the Gold Tip Hunter XT Arrows by 0.001 inches, but that one inch can make a difference if you can utilize it. The 400 spine feature 10.2 GPI (see here for more info on the GPI), which is more than okay. The arrows will pertain velocity, and due to the mixture of carbon and aluminum, these arrows will react well to wind and penetrate the target. The aluminum makes the Easton FMJ N-Fused Arrows highly durable, providing steady spine and straightness, as well as high potential energy upon release. I do love the Easton's "bone-crushing penetration," and you certainly do feel the power of the arrow once you release it. These are genuinely and FMJ arrows. The metal jacket will also help you remove the arrow from the target, due to its aluminum cover. What I love about these arrows is this mixture of strong penetration capabilities combined with 0.002-inch straightness. The arrows will hit and penetrate the target, but won't bend even after you use them for years and years. It is also easy to remove the arrow from the target, which is convenient. When it comes to the downsides, there just isn't one. The only thing people complain about is too vague product description. So, to clarify everything here, you will receive six arrows. Also, do not buy extra inserts for they are included in the product. Maxima RED Carbon arrows excel at accuracy, probably better than any other contenders on this list. 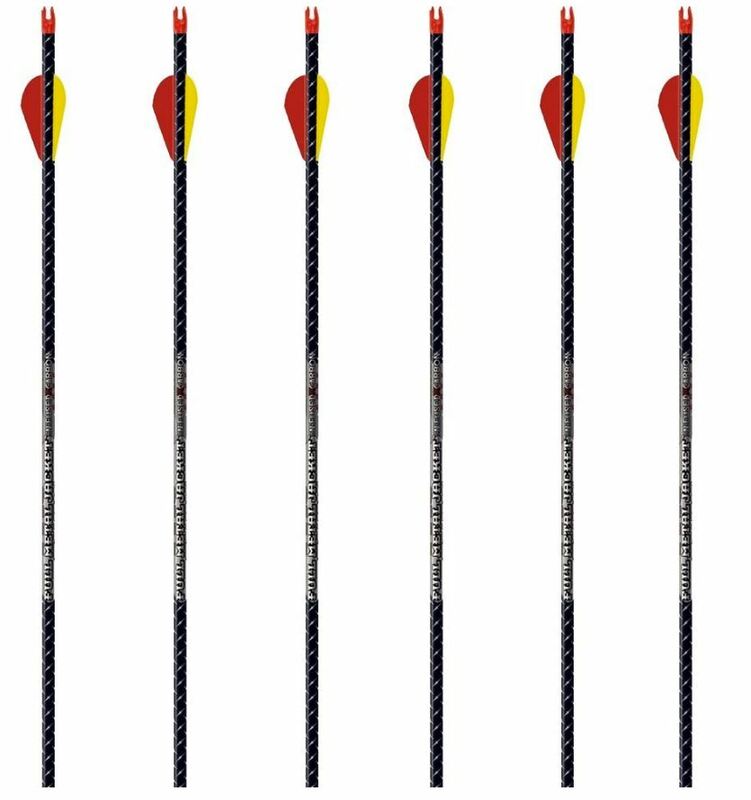 These arrows feature dynamic spine control, putting the focus on efficiency more than anything else. Arrows are made of next-gen carbon material, improving the broadhead's flying capabilities. Maxima RED Carbon arrows also feature something they call Red Zone. In essence, Red Zone is the integrated part of the arrow's shaft, one that controls the arrow's flex while in the air (upon release). Red Zone's job is to minimize the arrow's oscillation in the air, assuring maximum consistency and precision. The arrow's broadhead shifts the center of mass towards the front of the arrow, ensuring optimal flight balance. In the case of Maxima RED Carbon arrows, the broadheads enhance arrow's flexing effect while in the air. It is like having wings at the front of your arrow. And because these "wings" are at the front of the arrow, all the force will be gathered at the broadhead upon impact. Carbon Express pays close attention to each manufactured arrow, performing laser checks to evaluate the straightness. These arrows have 0.0025-inch straightness, and won't bend even after long time use. Another thing I like about the Maxima RED arrows is the Launchpad nocks, which grant the hunter more control upon release. Launchpad nocks also provide more comfort during rapid fire, allowing you to be consistently accurate when you fire arrow after arrow. It is good if you miss the first shot too, but I doubt you will miss one if you pair these arrows with a quality bow. Launchpad nocks are also protected with BullDog nock collars, protecting the shaft from impacts. The 350 spine have 9.07gpi and have +/- 1.0-grain tolerance (you can find more about the grain tolerance here). I would say these are amazing hunting arrows because of the Red Zone technology but aren't the best. They will fly fastly and accurately, better than any other arrow on this list, except for Victory Archery VAP TKO Gamer Shafts, which are better for precision and penetration. The downside is the price since they do cost more than almost every other arrow on the list (apart from the Victory Archery VAP arrows). However, if you have a good bow, you will need fantastic hunting arrows, right? Though not the best hunting arrows, Easton Aftermath arrows are excellent for beginners and amateurs alike. Due to their price, they are excellent for target practicing too. However, don't think they won't hit the target just because they don't cost a lot. These cost-effective arrows are made of carbon, and come in black colors, bringing death to your prey. The spine is 400 with 8.8 GPI capabilities. The Easton Aftermath arrows are designed to cut through the air, regardless of the wind power. They are made for outdoor use, making them a valuable choice for the hunters. Apart from the fact that the arrows deal well in windy conditions, they are also good at penetrating the target, even through bones, due to their smaller H diameter penetration. However, be aware that the inserts for the arrows come separately, allowing you to adjust the arrow to your liking. You will receive them upon purchase. So, Easton Aftermath Arrows are cost-effective, swift and deadly, opting great at windy conditions. However, there are several things I don't like about them. The straightness tolerance of these arrows is +/- .005. If you remember, we said that anything below 0.003-inch straightness is preferable. What this means is that the arrow won't last as long as other arrows would. Over time, they will deform and lose their original form, become less accurate and slower. But, they are cheaper, so I guess you can call it a compromise. The design is both good and bad. One one hand, these arrows are smooth, slick, very good at cutting through the air on its way to the target. They will, without the doubt, hit and kill the target, even at a mid-range distance. However, they are less durable and will lose quality over time; other arrows will too, but not as fast as this one. If you are a beginner or have a low budget, then definitely go for these arrows. When it comes to speed, precision, and penetration, they are amazing but don't expect them to last a lifetime. It is as if the VAP TKO Gamer Shafts are in the league of their own when it comes to penetration and weight tolerance (+/-0.5 grains). Arrows come with F Nock (6 grams) and Shok aluminum insert. These arrows are carbon made, each arrow digitally monitored and checked during the production process. Gamer Shafts feature 0.003-inch straightness tolerance, assuring durability and consistent precision. Due to the manufacturer's focus on the penetration, I believe these are the deadliest arrows on the list. VAP TKO Gamer Shafts utilize Maxxke technology. This technology ensures better torque control, fantastic stability during windy conditions, as well as spine consistency. Maxxke technology is implemented to improve the arrow's penetration and flying abilities, and the technology did very well, for these arrows both fly and kill, swiftly and mercilessly. Vanes are hand fletched, assuring that the vanes align correctly with the broadhead. On top of all this, Victory Archery implemented high-level nanoceramic coating. Each arrow is "icy," coated to provide maximum penetration abilities. And due to the nanoceramic coating, these arrows are also very easy to remove from the targets. Weight tolerance is amazing, +/- 0.5, assuring consistency after each shot, as well as tighter grouping. It is also worth mentioning that these are micro diameter arrows. Due to the arrow's design, they strive for top speed, maximum penetration, and less wind bending. Victory Archery VAP TKO Gamer Shafts excel at penetration and micro diameter design. They are swift, smooth and deadly, excellent in windy conditions. They are also very durable, and easy to remove from the target. They are, however, the most expensive arrows on this list. I love the hand fletched vanes. It makes the arrows more comfortable and reliable, clearly showcasing that Victory Archery pay close attention to detail. And don't forget the ice nanoceramic technology, which ensured maximum penetration and more comfortable arrow removal from the target. Apart from performing well, they look amazing and feel amazing too, very slick and smooth. But if you want these arrows, you will have to pay the most for them. To assure that you select the best hunting arrows, you have to go through some factors. There are things you should consider before you buy the arrows because, well, the arrow is to the bow what bullet is to the gun. Most of these factors will depend on your bow setup, your preferences, and your needs. So, let's go through these factors. It is often best to select the arrows that are heavy and stiff, the more, the better. Naturally, you will have to check bow and arrow compatibility. Selecting the bows of the right size and weight is important to you and your bow. If you want your arrows to hit and kill the target, you should look for those with higher penetration (such as Victory Archery VAP TKO Gamer Shafts, or Maxima RED Carbon arrows). I suggest you go for the thin, micro-diameter arrows, for they are faster and more accurate. Micro-diameter arrows deal better with the wind and are known to penetrate almost any material. If you are hunting big animals, you will need micro-diameter arrows. Micro-diameter arrows also work better at the range since they won't lose velocity or be affected by air resistance or wind; they will cut through the air efficiently. Again, going for Victory Archery VAP TKO Gamer Shafts is the safest bet, due to their slick and thin design. For instance, Victory Archery VAP TKO Gamer Shafts have hand fletched vanes, which spin the arrow simply enough to improve its velocity. If you can, perhaps it is better to opt for the four fletched instead of the two fletched wines, for they will grant optimal spinning control of the arrow. This is more a preference thing. Some hunters don't like the way four fletched vanes feel and opt for the two fletched. It is, however, something you should keep in mind when buying the arrows. Arrows are expensive, mainly if you use them on a regular basis. Some hunters chose to neglect the importance of arrows, thinking that every arrow is the same; this is false. Selecting the right arrows is as vital as choosing the right bow, and you want not only those that fly and kill but those that are durable and will serve you for a long time. The two most expensive version is the most durable ones (Victory Archery VAP TKO Gamer Shafts and the Maxima RED Carbon arrows). Due to their design, they are also easier to remove from the target. These small things add up (such as Ice nanoceramic coating and Red Zone technology), and though you might not notice the benefits of these little details, they will prove their use the longer you use the arrows. Consider weight and straightness tolerance, design, looks, and the feels. I cannot stress enough how important it is that the arrow feels right in your hands. You can have the best arrows in the world, but if you don't like them, they are of no use to you. Think of the small things, things that matter to you individually. Perhaps you want the arrow color to match the color of your bow. You also don't want long arrows if you have short hands, right? Think carefully about these things. And though arrows are mainly used for close range shooting, some have better range than the others. Then again, why would you pay for mid-range capabilities if you don't plan on using them? These are just some of the things that come to my mind when I think about the hunting arrows. Again, you want the best hunting arrows for you, not the best hunting arrows in general. Perhaps you are a beginner; why would you spend a lot of money on expensive arrows if you want to try out bow and arrow? If you are tree stand hunter, check our bow hunting tree stand review page. Alas, we arrive at the end of our topic. If you are beginner looking for tips, I assume this is all overwhelming, but don't rush your decision. Bow and arrow are ancient, noble tools, and are also very personal. There are a lot of things you have to take into consideration when you are buying them, but it is better to spend more time reading than more money shopping. If unsure in any of these things, either go for the least expensive ones (Gold Tip Hunter XT Arrows or the EastonAftermath Arrows). Or, go for the best ones, the Maxima RED Carbon or Victory Archery VAP TKO Gamer Shafts, especially if you paying for these arrows won't "hurt" your wallet too much. Remember that you pay attention to all the things we mentioned, such as weight, penetration capabilities, durability, speed, diameter and other important factors. And if willing, add a personal touch to your selection, opting for ones that also look great. Consider as many factors as you can, with the focus on arrow accuracy and penetration.